I was browsing Kult of Athena’s website recently and saw a new(?) Deepeeka offering called the Reaver Axe. To my eye it matches very closely the style of axe found in the Mac Bible with varying haft lengths. It features a pinned construction where the blade is riveted to the socket. 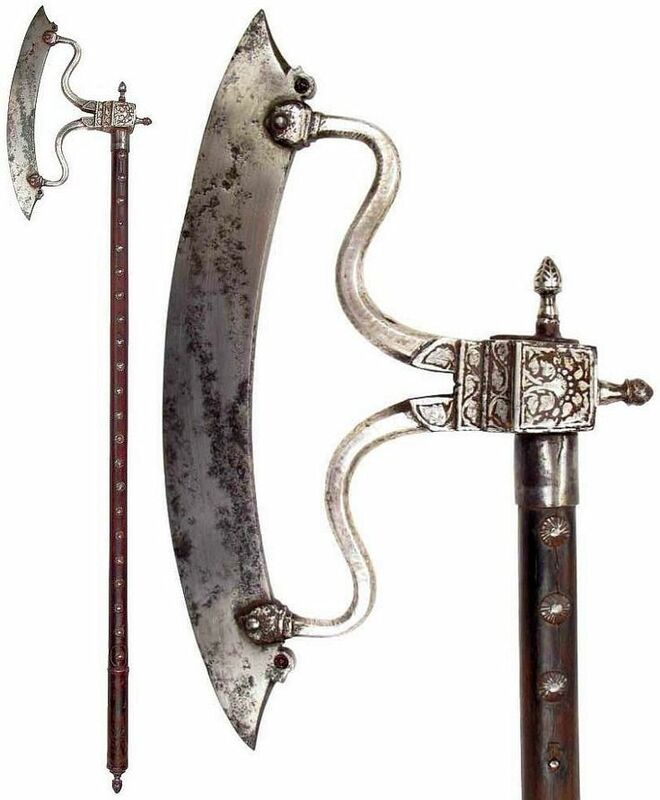 I was under the belief that most period axes featured drifted sockets for various reasons - one of which may have been to eliminate stress on the transition from socket to blade in a striking weapon of this kind...though I imagine that the handle would fail before these large rivets would. Does anyone know of the historical plausibility of construction of this type? This kind of pinned construction is really an artifact of modern manufacturing methods and modern available raw material. Both the blade and socket are simply cut from a sheet of steel, the eye is rolled, the holes are drilled, and the pins peened. But back in the days, you didn't have pre-made supply of sheet steel, you didn't have very efficient drill bits, drill presses or electric hand drills, while on the other hand everything required to be forged in the first place as the only material available came in inconsistent lumps, and forge-welding was a technique every blacksmith had no choice but to master. Even during the times of direst needs, for example around 1793-94, when the young republican French army was fighting royal powers of Europe, forges were set all around Paris to forge pikes, as there was way too few muskets being produced to equip all troops and militias. And these pike heads, while simplified in design for mass production, had forged sockets and forged blades, and basically every blacksmith apprentice was supposed to be able to make one, and sometimes even people without any previous forging experience. I know it's centuries after the Maciejowky's Bible, but there hadn't been any significant technological leap in forging methods. I don't mean to say that the kind of axe Deepeeka offers is total ahistorical and was never made, but it wouldn't have been any more convenient than a more conventional method (punched through and drifted, or folded over and forge-welded, which are the two main methods). The Deepeeka axe has the same silhouette, but it's not at all a reconstruction of these axes. To my eye it matches very closely the style of axe found in the Mac Bible with varying haft lengths. The axes you show in art just look like decorated axes. I don't think the markings say anything about the method of construction. There are axes where the eye is made from a flat piece rolled around and welded to the blade. Sometimes, it is forged as one piece with the blade (and therefore welded on only one side) and sometimes it's a separate piece (and welded on both sides). Most of the examples of this I've seen have been Indian. 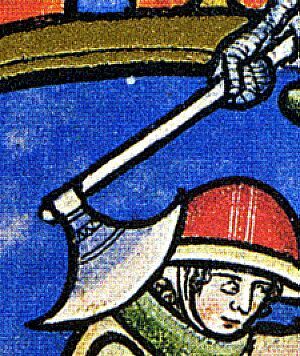 I don't know of any European axes like this, but Waldman, "Hafted Weapons ..." has examples of halberds with eyes done in both ways. where riveting might be used as an easier alternative to welding wootz to wrought iron. Thanks Timo. 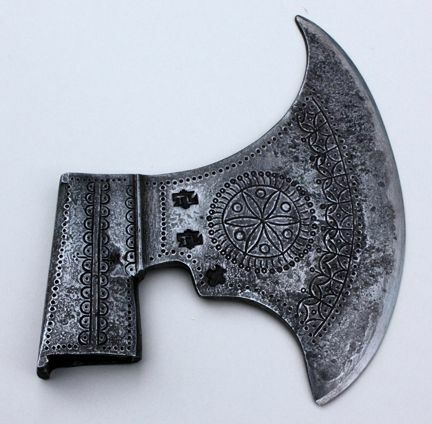 I was interested to see that there was a Deepeeka axe of very similar shape to the Mac Bible axes - not suggesting they were riveted, but was curious to see if riveted axe construction of some kind was ever used in the way seen in the modern repro. Thanks for sharing your sources! Out of curiosity, do you have any info on the second axe you posted? - the darker one. I would be most interested in country of origin and time period. That particular one is a modern replica, but it's very much like the ones copied. 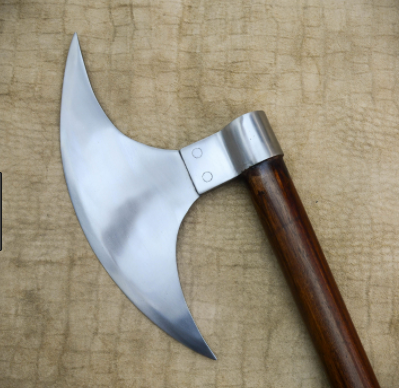 See https://bighornforge.wordpress.com/2011/07/28/norse-style-ax-by-tom-latane-pepin-wi/ for details. Don't know about these particular ones, but this style is very 17th century, Norwegian. Thanks for the link. I was thinking Scandinavian for that axe too - good to know my intuition was leading me in the right direction.